For the previous 6 albums, we recorded the new songs of each album just before we set out on a tour… Playing all the songs in various places for many different people nourishes the songs and the way we play. We decided therefore to make a new recording of the songs from albums 3 and 4 into this 7th album in 2017… The energy is different, the songs are stronger and clearer. In addition to all the songs of the 2 albums, like ‘Un soir d’été’, ‘Impressionniste’, ‘L’hiver en vers’, ‘Appeler tes étoiles’, ... we created 4 more (instrumental) songs. ‘On est rentrés’, ‘Promenade à Tioman’, ‘Les 3 moustiquaires’ and ‘Le chemin infini’ which all take us back to the days when we were travelling around, played with ethnic percussions and the ukulele. They remind us of who we are inside, after travelling… On est arrives ! Yes, we are back ! 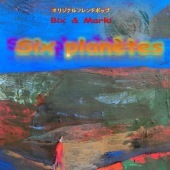 This 6th album is a firework of Bix&Marki’s musical influences. In “Nuages du Vésinet”, there are clouds in Bix’s hometown around the harmonies inspired by those of the great jazzman J. Coltrane. With samba feeling rhythm, a big calimba sounds as if playing into the deep sea: “Plongée torride”. We walk around in a picture by Mondrian and encounter surrealist situations in today’s world, reminding us of those of Ionesco’s, in “Monde riant”. We look for adventure & love in a multicultural place : “Les aventures au calin”. A boat is leaving a Spanish port in “La pluie sèche”. In “Le dernier paysage”, we draw a picture of what remains of our past. We may see our society as a stage, where we laugh, jump up and down, on or off the stage, playing today like people did in the Middle-Ages (Sautez la sotie). Inside us, there is a forest of feelings… (Sentimentologie). A painter paints the sky in the ceiling of a church, but beyond the ceiling there is the real sky. What is freedom (in Fresque)... we can’t change things, we can't get away, we can only live in our own dreams. Time passes and life goes on. Bix's ink drawing on the cover of CD shows an older lady telling her story... we are traveling further on a path, with our songs. Among the 6 songs, «L'hiver en vers», describes the feeling of waking up in the futon on a cold Winter morning, and looking out of the window at the blue sky of Tokyo. «Pétale confirmé» honours the unstable life of troubadours and musicians, who are bringing their music on their journey. «L'esprit plastique» is about consumerism vs. ideals in this society, where everyday life has one rhythm and the individual another. 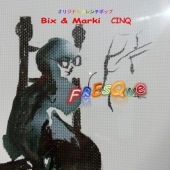 The cover is a painting by Bix, acrylic on papier. «Au Calin» :in an older building in the centre of Tokyo, things from around the world are sold… colors and shapes from other countries contrast with colors and shapes in Tokyo. 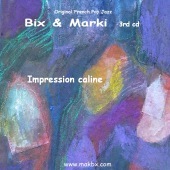 «Impressionniste» is a song about nature and light, a walk on the beach in Northern France or Belgium, and green, blue misty shades. «L'interstice de la nuit»: we spent a wonderful time a few years ago on the island of Corsica, we started playing this song on the sea side, in a village, under a tree in the evening heat. The guitar on this CD is a full-acoustic guitar. 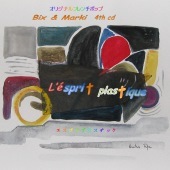 The cover is by Bix, pastel on rice paper. «Jeter un coup d’amour» : one parent each left us that year. Deep Fjords, waterfalls, smiles on their faces. Les «Papillons migrateurs»: some butterflies fly more than 4000 km to reach another continent, looking for a new life. 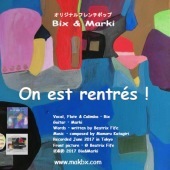 «Le cactus chauve» was Marki's first piece, for the group composed in Brussels in 2009. It was also the starting point of our collaboration. We wanted to help the victims of the Tohoku-tsunami, north of Tokyo and decided to make a CD of our songs. We sold it to collect funds, which we sent to the Japanese Red Cross. «Les deux ombres» reminds us of the time when we played with our African musician friends in Brussels, just before coming back to Japan in the Summer of 2010. Music, wishes,hopes and a feeling of unity. «Est-ce vrai?»: somebody comes back in a dream, or is it in the reality ... remembering. «L’avion dans la pluie» : a plane made of paper, flying in the rain... feelings go up and down, every day. «Oiseaux qui chantent» : listening to the so many birds in our neighbourhood in Tokyo… our friend left us too soon. 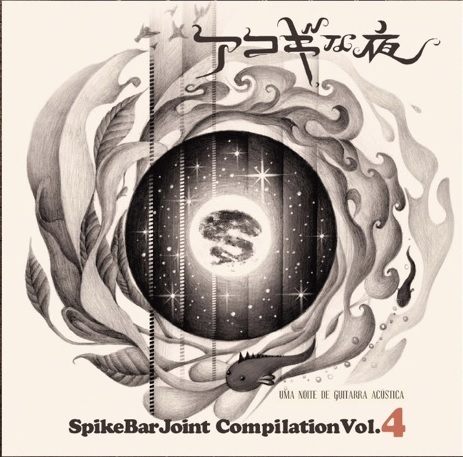 Omnibus album, with songs of several song writers in Tokyo. 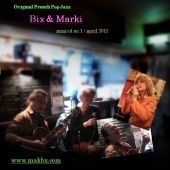 Includes «L'hiver en vers» (2nd version) of Bix&Marki. Two pieces by Ponta(sax) & Marki. We played for the first time in Cozmos Café in Feb. 2011, as guest musicians for another band. Later that year, M. Spike (manager of Cozmos Café and music producer) asked us to play at the acoustic guitar night every month. He produced this omnibus CD. All songs were recorded at Cozmo's Café.